Cheap things to do in San Francisco offer you the chance to save some money on your visit. My list of 25 activities includes both free options and others that cost less than $10 per person. 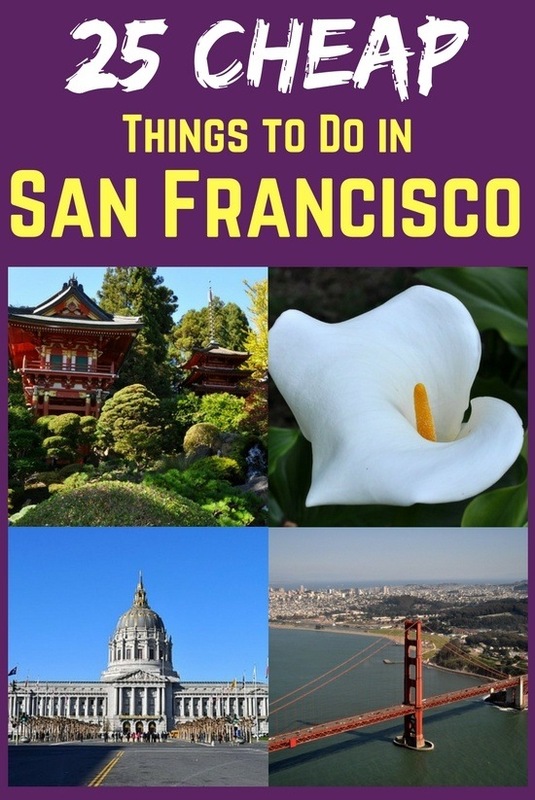 On my list, you will find top attractions such as the Golden Gate Bridge, Lombard Street, and Alamo Square. You will also find fun museums such as the Conservatory of Flowers, the Beat Museum, and the Mission San Francisco de Asis. This famous San Francisco attraction may be free to visit, but the view is worth a million bucks! You can relive that scene from "Full House" where the Tanners are having a picnic on the lawn right in front of a row of pretty Victorian homes with the SF skyline in the background. Just head to the centrally located Alamo Square neighborhood and get your camera ready to capture the pastel-colored, ornate Painted Ladies. Gorgeous Baker Beach lies tucked away from all the hustle and bustle, on the northwest corner of San Francisco. With unique views of the Golden Gate Bridge from the west, this is a fun place to explore the scenic cliffs and the water where the bay meets the Pacific Ocean. The walk to get here is fun and beautiful in itself--you can either take the coastal trail from the Presidio and walk down the Sand Ladder, or take the stairs from the lovely Sea Cliff neighborhood. Kerouac fans, get ready to be amazed--this museum in SF's North Beach is a real mind blower! And if you don't know about Jack Kerouac, Allen Ginsberg, or Lawrence Ferlinghetti, there's no better place to discover their work than right here where the Beat Generation began. Predecessors to the hippies of the Haight Ashbury, these 1950s writers and artists settled here and created a historic counterculture movement to which this museum now pays tribute. 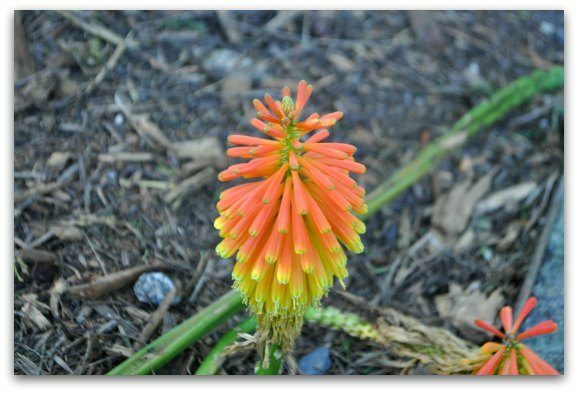 One of the most relaxing and cheap things to do in San Francisco is visiting the Botanical Gardens in Golden Gate Park. This well-groomed, beautifully managed 55-acre space features colorful plants and flowers from all over the world. There is plenty of natural beauty to admire here no matter what time of year you visit, and the Magnolia Collection and Redwood Gardens are always must-sees. During your visit, top off that coveted cable car ride with a trip to the SF Cable Car Museum so you can see for yourself all the behind-the-scenes action that makes them work. This museum is free to visit, and you'll not only see the giant wheels that pull the cables, but a lovely exhibit of cable car photos and history that explains the evolution of this historic method of transportation. The museum is located between Nob Hill and Chinatown, and doubles as a barn for the cars at night. Another way to find cheap things to do in San Francisco is to visit Goldstar for ticket deals. Tickets are up to 50% off and allow you to really save on top attractions, cruises, and tours. These are a few of the most popular. Click the links to learn more about them and to find other great cheap tickets while you are here. San Francisco is home to the country's oldest camera obscura and it is the only one that exists in a free-standing building. The concept of this giant optical device that produces 360-degree live images was conceived by Leonardo da Vinci, but this one dates back to the heyday of SF's former amusement park, Playland at the Beach. Located on Point Lobos Avenue, right behind the Cliff House, this fun relic is a great stop for photography and history buffs. There is so much to see and do in Chinatown, it's easy to miss the Buddhist temples, but they are interesting pieces of culture and open to the public. You'll find these sacred places decorated with red and gold, carvings and statues, lanterns, flowers, fruit, and more. Some of the religious figures are among the oldest Chinese artifacts in the US. Click the link below to find out how to get to these places of worship. SF City Hall is the centerpiece of the Civic Center district. Built in 1915, it has a grand presence with its ornate columns, large rotunda, and golden dome (the tallest dome in the country, even higher than the US Capitol!). If you visit during the day, you'll be able to walk around inside and admire the marble staircase and carvings that set the backdrop for so many weddings. At night, this architectural beauty is all lit up, and sometimes in different colors for the holidays or in support of the local sports teams. One of the most spectacular cheap things to do in San Francisco is to take in the excellent views of the bay and city from the observation deck of Coit Tower. You can also enjoy the colorful and historic Diego Rivera-inspired murals that line the interior, depict scenes of local life from the 1930s (this part is free). Coit Tower sits atop Telegraph Hill. To get here, you could either drive, take public transit, or walk up the Filbert stairs while listening to the park's well known wild parrots. A building that stores the ashes of the deceased is not exactly your typical tourist destination, but the SF Columbarium is truly beautiful and worth a visit. 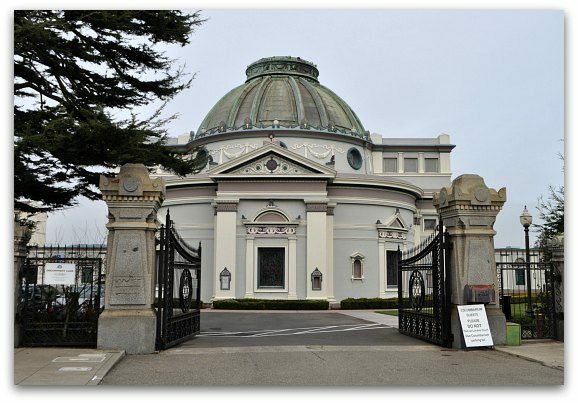 This neoclassical building was once part of a larger cemetery, but in the 1920s when burials were banned within city limits and all existing graves were being relocated, the Columbarium remained one of only two official places of remembrance in San Francisco. Step inside to check out the large rotunda, stained-glass windows, and the Harvey Milk tribute. Another one of the best cheap things to do in San Francisco is located in Golden Gate Park in a prominent, ornate white building. Opened in 1879, the Conservatory of Flowers stands out as the country's oldest public greenhouse made of glass and wood. Inside, it houses a great array of flowers from all over the planet, from lowland and highland tropics to aquatic plants and potted plants. There is also an incredible dahlia garden and special exhibits. It seems strange to have a $15 ticket here, but there is a great deal for visiting the two best fine arts museums in San Francisco. Admission is $15 to either one, but with your ticket you also get same-day admission to the other. Essentially, you get to see two renowned museums in one day for $7.50 each! By visiting both, you get to enjoy a diverse selection of paintings and sculptures, and two different areas of the city: Golden Gate Park and the Presidio. Diego Rivera was a celebrated but controversial Mexican painter whose legacy in San Francisco includes three brilliant large frescos. His murals date back to the 1930s and 40s, when he was a devoted member of the Mexican Communist Party. His work reflects different aspects of Californian lives and struggles, and has been admired for generations in these three public spaces where you can visit them for free. Walking inside the GLBT Museum in SF's famous Castro district is one of the most emotionally powerful cheap things to do in San Francisco. You'll be exposed to the past century of history in the international, as well as local, queer community--including information on Harvey Milk, a member of the San Francisco Board of Supervisors who was assassinated while serving as California's first openly gay elected official. On opening day in May 1937, some 200,000 people made the first historic pedestrian crossing of the Golden Gate Bridge. At that time, it was the longest suspension bridge ever built. Today, the bridge continues to welcome thousands of visitors from far and wide to see this shining orange architectural beauty in person. The Golden Gate Bridge is SF's symbol of pride and accomplishment, and probably the most recognizable bridge in the world. 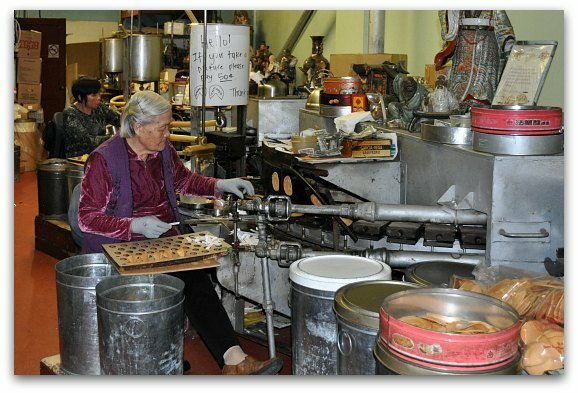 If you're going to spend some time in SF's Chinatown, take a few minutes to stop by the Golden Gate Cookie Factory for free. After having eaten so many fortune cookies at the end of a good Chinese meal, it's such a fun experience to see them being made! Watch the baking, folding, and fortune-wrapping of these treats executed by those who have kept this factory operating since 1962. One of the memorable cheap things to do in San Francisco is to visit Grace Cathedral, the third largest Episcopalian church in the nation. Located in the Nob Hill neighborhood, this beauty sticks out with its big French Gothic bell towers and its golden "Gates of Paradise." The inside is even more stunning, with its murals, labyrinth, and AIDS memorial. You'll see plenty of beautiful Victorian homes in San Francisco, but this is the only one actually open to the public. Built in 1886, it's a Queen Anne-style mansion with classic architectural features that have been very well preserved. Step inside to admire the grand woodwork and furniture, and get a glimpse of what it was like to live in SF during this era as if you were the Haas Lilienthal family. From the ornate wooden entrance gate to the five-story pagoda, continuing to the high arching drum bridge and to the zen rock garden, taking a stroll in the Japanese Tea Garden is like stepping into another world. This impeccably landscaped and beautifully serene place will have you feeling relaxed and refreshed. Don't miss this gem in Golden Gate Park--it's inexpensive to visit at any time, and totally free on some weekday mornings! Another favorite among the cheap things to do in San Francisco is visiting the famously crooked Lombard Street. It's so steep that cars traverse its curves back and forth eight times in just a one-block stretch as they descend from Hyde to Leavenworth. From the top, you get a great view of Coit Tower and the SF Bay, and from the bottom you can snap that classic picture of the winding red-brick road peeking out from the green gardens. This small but well done museum in the popular Fisherman's Wharf district brings to light what made this waterfront community thrive in the first place. Completely free to enjoy, the museum does a great job of teaching about life at sea for San Franciscans through old artifacts, colorful murals, and hands-on exhibits. Plus, you'll get excellent views of Alcatraz, the Hyde Street Pier, and the Golden Gate Bridge from here. Ever wonder what gave SF's now trendy Latin district its name? 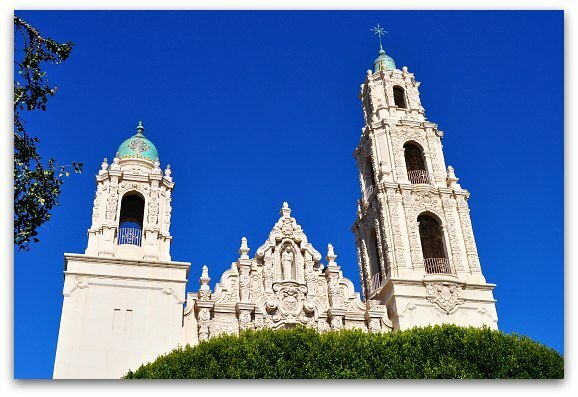 Made with thick adobe walls, the Mission San Francisco de Asis (more commonly known as Mission Dolores) is the oldest building in San Francisco and played a huge role in the Spanish colonial era of this city. Here you'll find a chapel, basilica, cemetery, and a lot of interesting history. This celebrated work of architecture is one of the most photographed and filmed sites in San Francisco. The Roman columns, grand rotunda, and reflective lake are both peaceful and awe-inspiring, the perfect place to take a romantic stroll or have a picnic with the family. The Palace of Fine Arts is the only remaining relic of the 1915 Panama Pacific Exposition, the city decided to keep it since it was too beautiful to tear down like the rest of the fair. Another one of the cheap things to do in San Francisco for art and photography fans is to visit the Pier 24 Photography Museum. Behind the unassuming door to the pier, you'll find a whopping 20 different galleries of beautiful photographs, each with a unique layout. Admission is completely free, but you will need to make a reservation in advance to get in. They recommend allowing about two hours to enjoy the whole museum. Meandering the city and admiring the art all around it is one of my favorite cheap things to do in San Francisco. There are over one thousand murals spread throughout the city's streets, and many are concentrated in the Mission and North Beach districts. ]There are also incredible, historic murals on the inside walls of Coit Tower, the Rincon Center, and the Beach Chalet. Click the link below for tips on where to look for these incredible works of art. Find great deals on your hotels on Booking.com and TripAdvisor. Both give you an insider's view on deals all around town. Click the links below for details. In addition to these 25 cheap things to do in San Francisco, you will also find hundreds more free activities. Free Events: Every month, you will find almost a dozen free festivals and events. Many are fun street festivals with live music and other entertainment. Some of our film festivals are also free. Click here for an entire list ordered by month and a few that last several months long. Free Attractions: SF has many other free attractions in addition to the ones mentioned above. Find a list of my 10 favorites here. Free Museums: I've mentioned some of the free museums above, but you will find more on this list. They include the Maritime Museum, the Wells Fargo Museum, and the Fire Department Museum. Find a full list here. All Free Things to Do: This is where you will find all of the best free things to do. Click here to check it out today.